From early humble beginnings to present day, NCC has remained a vital part of the Newmarket Community. The church continues to demonstrate an ability and willingness to step out in visionary faith and take risks to serve God and the Community as the Body of Christ. Newmarket Community Church was established in 1828 as the First Congregation Church. Reverend David Sanford was the first pastor. At inception the building had neither steeple nor vestry. Though humble, 400 citizens called it home. 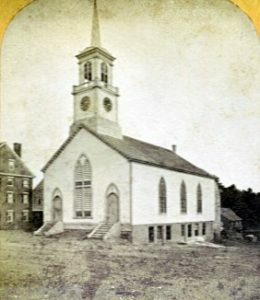 In 1840 the church steeple was added and in 1855 the building was raised and the vestry (now the Fellowship Hall) was put underneath. Later that same year the organ was installed into the larger sanctuary. In 1871 Newmarket Civil War veteran John Palmer decided the citizens needed a clock to be seen by everyone downtown and the clock tower was so installed . In 1959 after much planning and labor the Christian Education and Church Office wing was added to the rear of the church. The project cost $37,000 dollars to complete. Today, Newmarket Community Church has close to 200 members and remains active in the community with numerous mission projects and services. Read more about the early history of NCC and the mystery of the steeple tower at the Newmarket Historical Society website.